We are the voice for the community. Welcome to BRECA. We are a volunteer community organization. The goals of the association are to promote citizen involvement and enhance the community. Check out the agenda for the 2019 BRECA Annual General Meeting below. Our focus this year is on Emergency Preparedness. Lots of interesting community information will be shared! 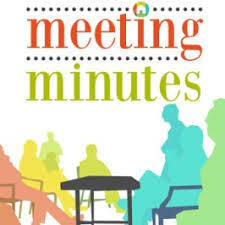 See below for the minutes of the BRECA Steering Committee meeting, February 26, 2019. 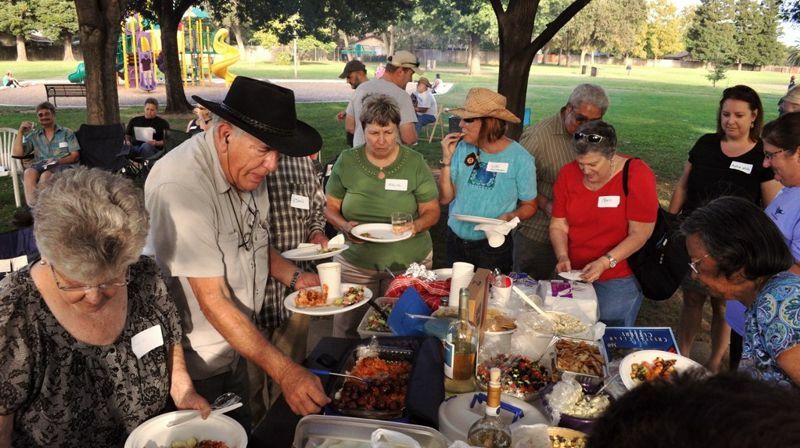 The Steering Committee meets each month, on the fourth Tuesday at the Rancho Cordova Library at 9845 Folsom Boulevard. The Steering Committee hopes to see everyone at meetings to give their input on goals and objectives for the Community. Greetings Neighbors! It’s time for the Annual BRECA Easter Egg Hunt. 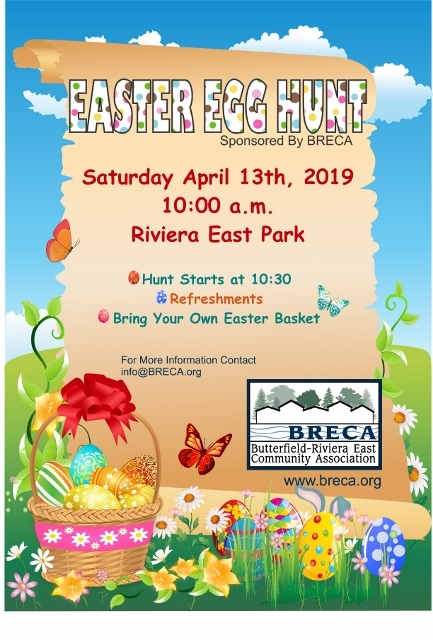 That’s right … that cute Easter bunny will be dropping by Riviera East Park and dropping eggs for all the kiddos to find! See below for details … Hope to see you all there!! Theresa Bible with the Sacramento Tree Foundation spoke briefly. She stated that she is a community organizer and her main focus is on underserved areas. She wants to help people organize things like tree planting, mulching or cleanup. Possibly they could partner with other organizations like BRECA. One amendment was made to the draft minutes of January 22, 2019. Lori Christensen made a motion to approve the amended draft minutes. James Adams seconded the motion. The motion was approved with 7 votes in favor and 2 abstentions. The report from the Treasurer was deferred to the Budget item. Carmen Mitchell reported that there was a meeting of the Cordova Community Planning and Advisory Council (CORPAC) this month. There were no items directly relevant to the BRECA area except that one person who lives in the area has been appointed to CORPAC. Jim Morgan reported on Welcome Packet distribution. He stated that five packets had been distributed to the first batch of addresses of sales from the Sacramento Bee and that three additional packets had been given to other addresses where sales had occurred. Lynda Hammitt commented that the Outreach Committee has discussed ways to improve the Welcome Packets. She stated that it would be nice to have more items in the packet, such as a calendar of community events, including BRECA events. Andrea White suggested including Cordova Recreation and Park District information, and Gay Jones stated that she has a small pamphlet from Metro Fire that could be included. Andrea White distributed a proposed revised budget from the Budget Committee. She stated that a major change in the proposed budget is increasing the minimum dues from the current $10 to a proposed $15. She stated that the Budget Committee expected that this would increase BRECA’s revenue by about $220. Jim Morgan stated that there were two assumptions made to come up with the projected increase. First, it was assumed that no members dropped or failed to join because of the increase in dues. Second, it was assumed that people who are already giving $15 or more would not increase their combined dues and contribution to BRECA. To the extent that these assumptions are incorrect, it would result in less money coming in (first assumption) or more money coming in (second assumption). Hopefully they would cancel out and result in the projected increase in revenue being realized. Gay Jones stated that we need to establish a designated reserve fund, as people think BRECA has lots of cash on hand, so where is the problem? A member of the audience suggested removing the “Reserve” line from the budget page, since it does not have to do with income and outgo. Jim Morgan suggested that there should be a second page that deals with bank balances. Lori Christensen commented that maybe we should vote on the dues increase separately. Andrea White continued with other changes to the proposed budget. These included reducing expenditures by having a split role for the nomination form for the Steering Committee elections, that is, e-mailing to members we have e-mails for and U.S. mail to the rest. There is also the non-profit filing fee for reporting to the Secretary of State that was added, and the cost of the P.O. Box has increased. For the Easter Egg Hunt, we would also do a split role. The Picnic will need increased postage. Overall there is still a balance of negative $110. There was discussion of the proposed dues increase. Carmen Mitchell said that she thinks that $15 is reasonable. In response to a question, Jim Morgan stated that the dues have been the same for 22 years, i.e. since BRECA was formed. Others pointed out that there has been inflation, and BRECA is trying to do more for the community. Rene Hamlin made a motion to approve the budget as proposed. Carmen Mitchell seconded the motion. The motion was approved unanimously. Gay Jones stated that the American River Parkway Foundation is removing the native plant garden at their office. They have a number of plants that they want people to take, and Gay suggested planting them at Gristmill. James Adams stated that they are waiting on a draft decision on the General Rate Case. Lynda Hammitt stated that almost all the speakers are confirmed for the Annual General Meeting. Andrea White stated that the Cordova Recreation and Park District has agreed to let us use a microphone and amplifier. Lynda handed out a draft of the proposed flyer, and there was discussion of various ways to improve the flyer. James Adams stated that one of the Butterfield Riviera East signs had been smeared with black chalk. He had called the County, and they came out and cleaned the sign. Gay Jones stated that a Sacramento County Parks ranger had spoken at the recent American River Parkway Coalition meeting. He stated that they are working on the problems with camping on the Parkway by checking for warrants, citing for off-leash dogs, etc., as they can no longer cite for illegal camping. 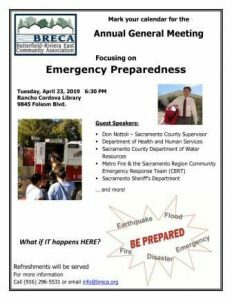 The next meeting of the Steering Committee is scheduled for March 26, 2019, 6:30 pm at the Rancho Cordova Library.